After a month of planning the day had finally arrived. 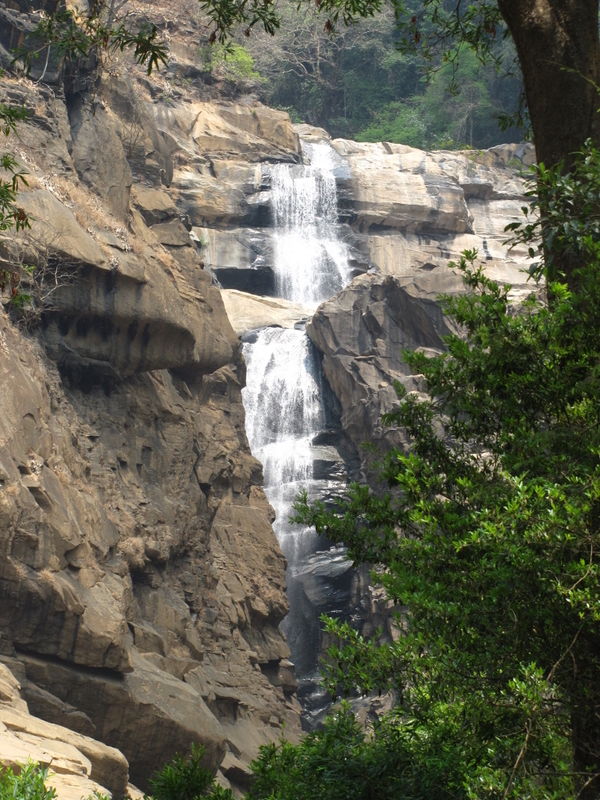 We boarded a Tempo Traveler(TT) to Male Mahadeshwara Betta (MM hills) on a friday afternoon. 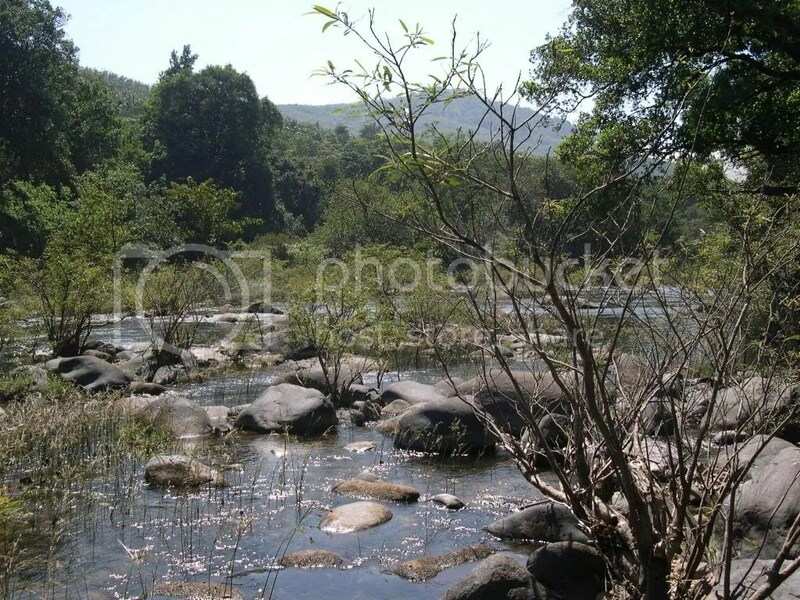 The forests around the Kaveri river have been relatively unknown to me until my last trek to Soligeri. 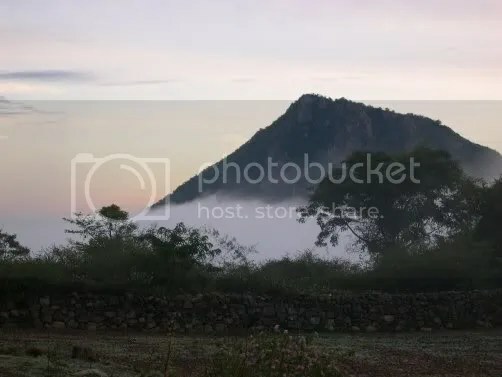 Now we were all set to explore another region of the Kaveri valley during this trek from MM hills to Palar via Naagamale village. 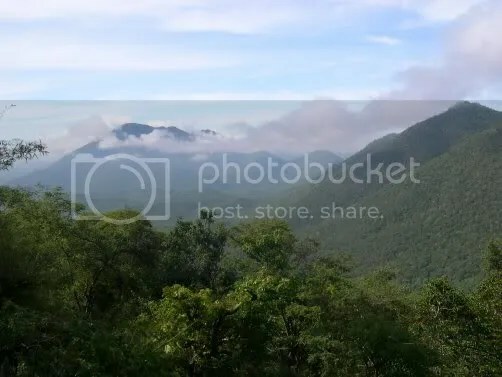 This trek is part of the mystery trails trek, a forest department initiative. After the end of sandalwood smuggler Veerappan a couple of years a ago, the forest department has opened a few trails in Chamarajanagar, Kollegal and Kanakapura wildlife divisions. Though we have been trying to come here since last year, we could get booking for the route of our choice only this time. Naturally we were excited and many people showed interest in joining the trek. Till very recently I was finding it difficult to find an other person willing to join my treks. But these days it is becoming hard to say no to people. After much deliberations, we finally limited the count to 10. Our group consisted of Naren, Seema, Chinmay, Ananth, Gautham, Ashwath, Keerthi, Nalini and Balaji. There are two routes from Bangalore to MM hills. One is through Kanakapura and other is through Maddur. We took the Maddur route since the new 4 lane way from Bangalore to Mysore is in excellent condition. From Maddur, we have to deviate to Malavalli, cross Kollegal before reaching MM hills. The road from Malavalli to MM hills is generally bad and at parts there is simply no road. We managed to reach MM hills at 9.30PM. We had reserved the rooms in Shivadarshini, an accommodation facility run by the temple administration. 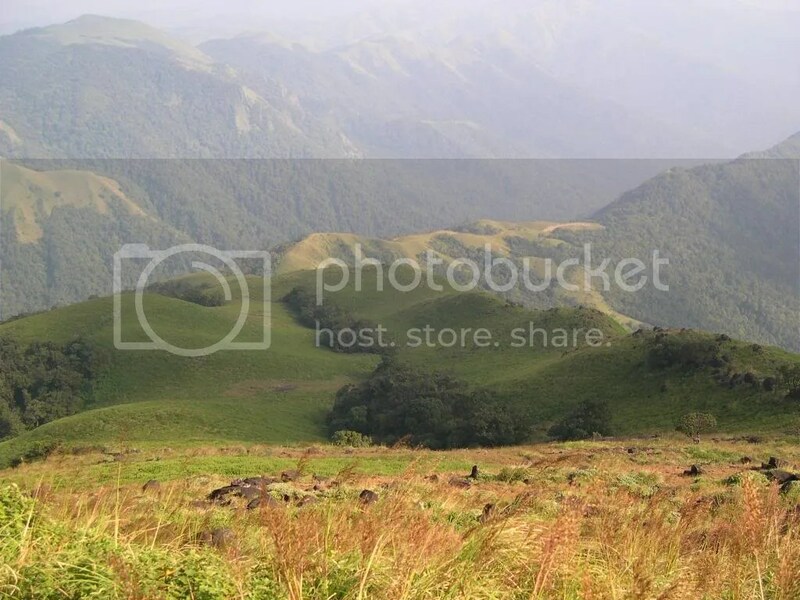 MM hills, situated at an altitude of 900m is a very famous Shaiva pilgrim centre. There is an ancient Shiva temple here to which thousands of pilgrims visit. After a simple but tasty dinner in the Nanjundeshwara hotel, we ended the day. Saturday started early for us. We paid a visit to the temple early in the morning, but weren’t allowed to go in as the temple opens only at 8.30AM. By the time we assembled at the forest office after finishing breakfast and packing lunch for the afternoon, it was 8.30AM. After paying the fees for the trek and signing on the risk form, we got going at 9AM. A guide (Iranna) from the forest office and a couple of other villagers were to accompany us for the trek. 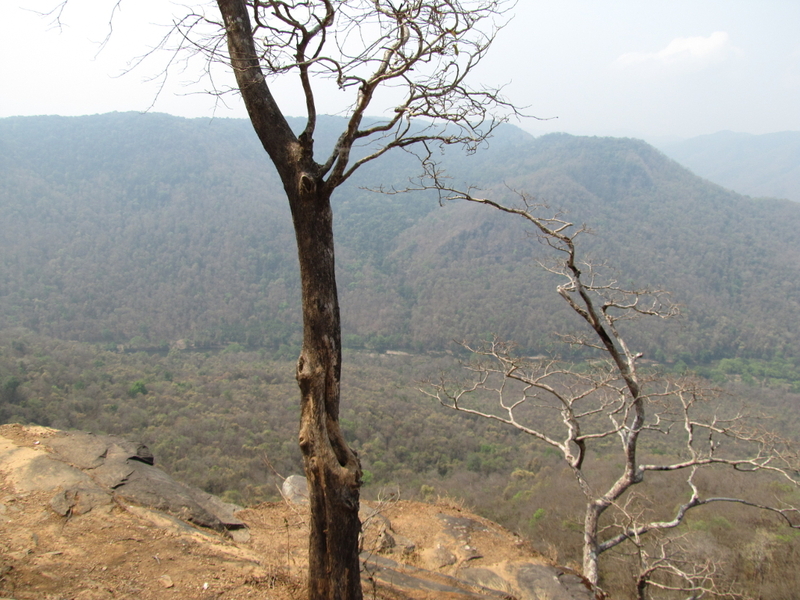 The route from MM hills to Naagamale is less of a trail and more of a village road. 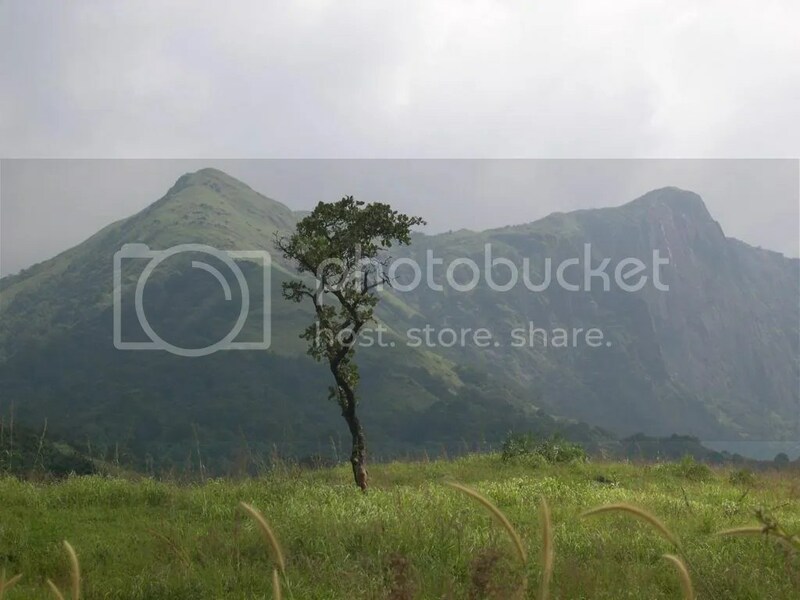 This is in fact a pilgrimage trail taken by people to reach Naagamale. Though the trail distance is 14km, the terrain is mostly easy since there is no great altitude variation. It takes almost an hour’s walk before we get past all the villages and start walking in the forests. It rained a bit as we left MM hills, temperature was in 30s and humidity was high. This made all of us sweat a lot. 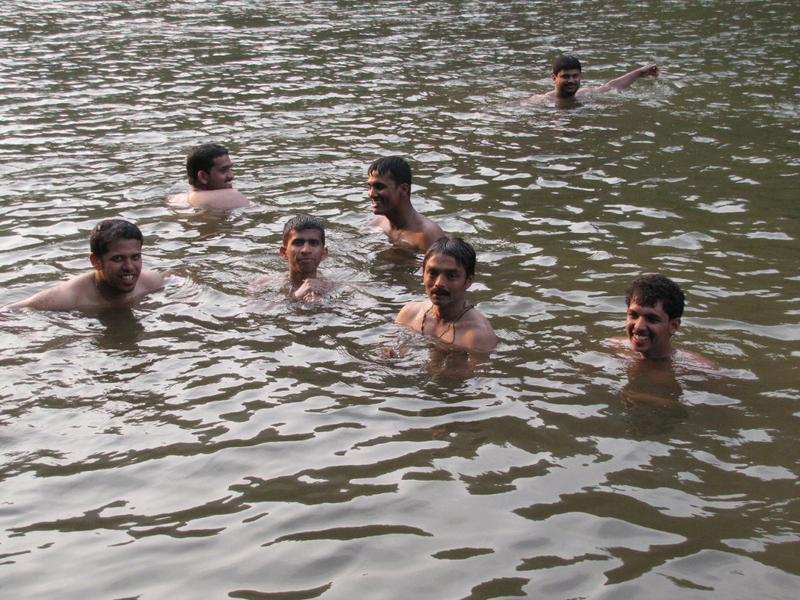 At around 11AM, we reached a place which had a small water body, called Gaudsi lake. 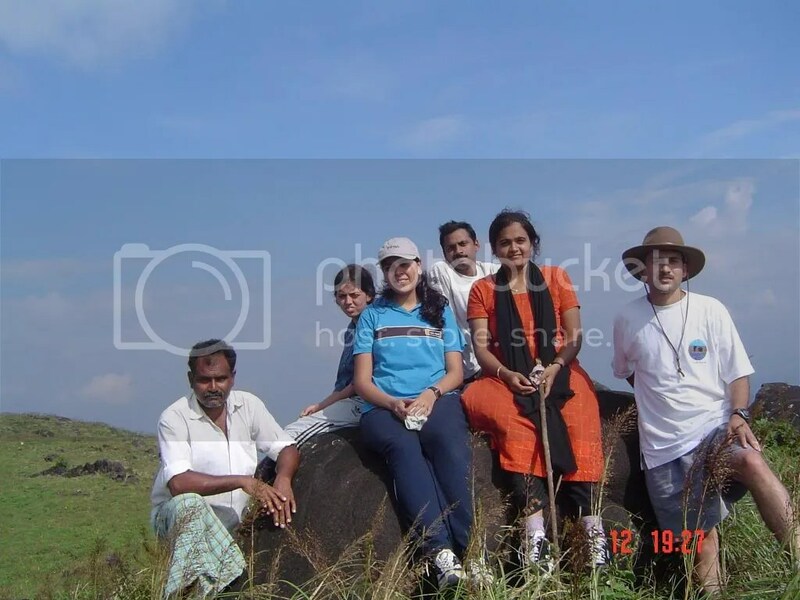 A group of villagers proceeding towards MM hills informed us about the presence of elephants in the area. They had spotted a few a couple of minutes back. We could sense some movement on the other side of the lake and we expected to get at least a glance of the elephant. 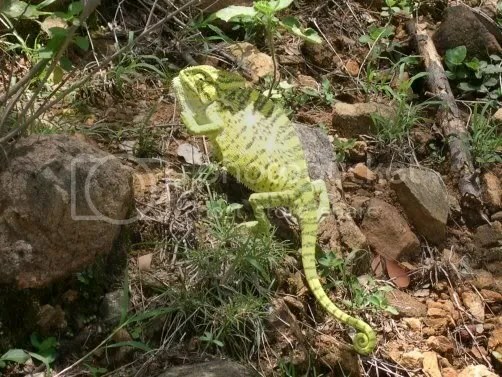 Since the area is very bushy, even if an animal is present, spotting it wouldn’t be easy. Our guide Iranna sent one of the villagers to the other side of the lake to look out for the elephants. 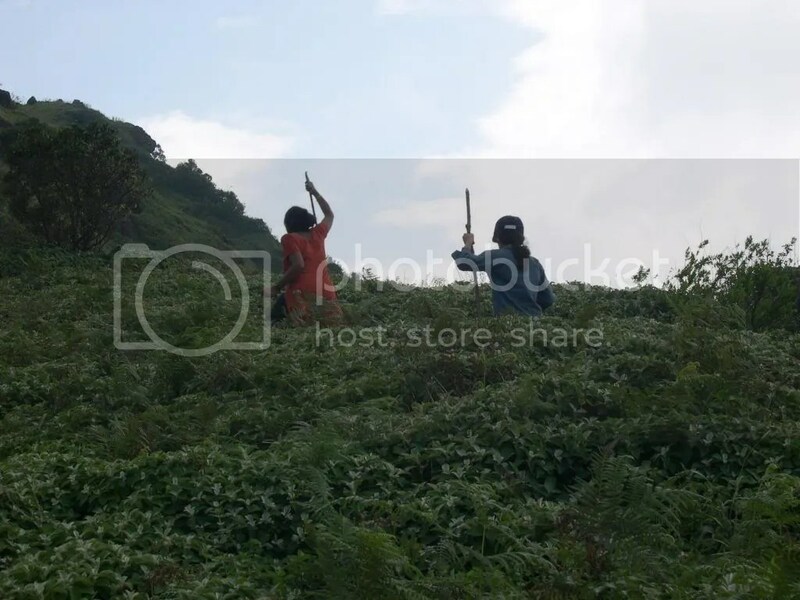 We could see Iranna loading his 303 rifle even as the villager rushed back after spotting an elephant in the bush. The anticipation was growing and we decided to wait for the elephant to make an appearance. The stage was all set for the show. The lake itself was the stage, the elephant was the performer and we were the spectators at the other end of the lake. While some of us argued about the futility of the whole wait, Iranna was keen on waiting. After a difficult 15mins of silent waiting (some of uswere too excited to remain silent), the drama unfolded. 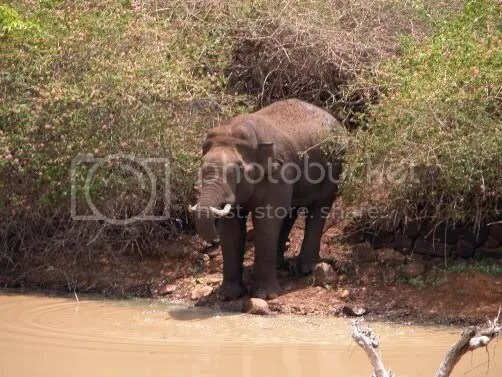 The area hadn’t received much rains this season and this lake was one of the few remaining waterholes for elephants. 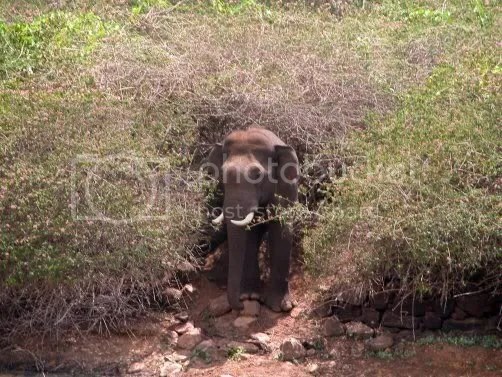 Probably unable to bear the thirst and heat, the elephant, which was all this while waiting for us to move on, decided to come out of the bushes. As it made a majestic entry, we were absolutely thrilled. It was an almost fully built adult male elephant with tusks of half a meter length. 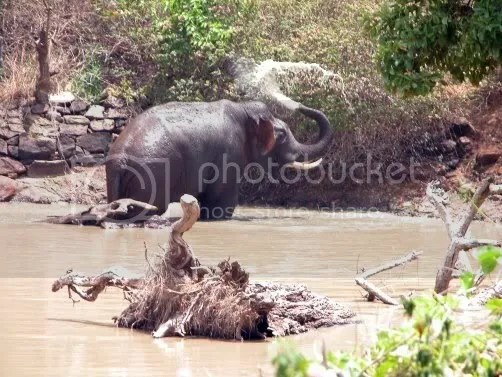 First the tusker performed the ritual of mud bathing. In the next act, it entered the lake and quenched its thirst. Then it was full 15mins of bathing which invovled sprinkling of water all over its body. The continuous clicking of 10 cameras from the other side made little difference to the tusker. 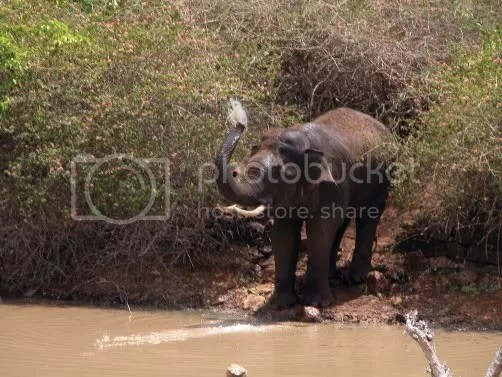 Finally satisfied with its act, the elephant performed its last act, which was mud bathing and disappeared into the bushes. It took some time for us to realize what we had witnessed. We had seen an a lone tusker in its territory. And that too not from a far off distance sitting in a protected vehicle. But we were as close to elephant as 50m, without any protection and at the complete mercy of the elephant. And it was the most thrilling moment of my 6 years of trek life. It took another 20min for us to reach the next village called Indignata(874m). On the way we saw a dried dung of a carnivore which had lots of deer hair. Iranna informed us that it was leopard’s dung. After a tea break at Indignata, we trekked for another 90min to reach our destination, the Naagamale(853m) village at 1.30PM. 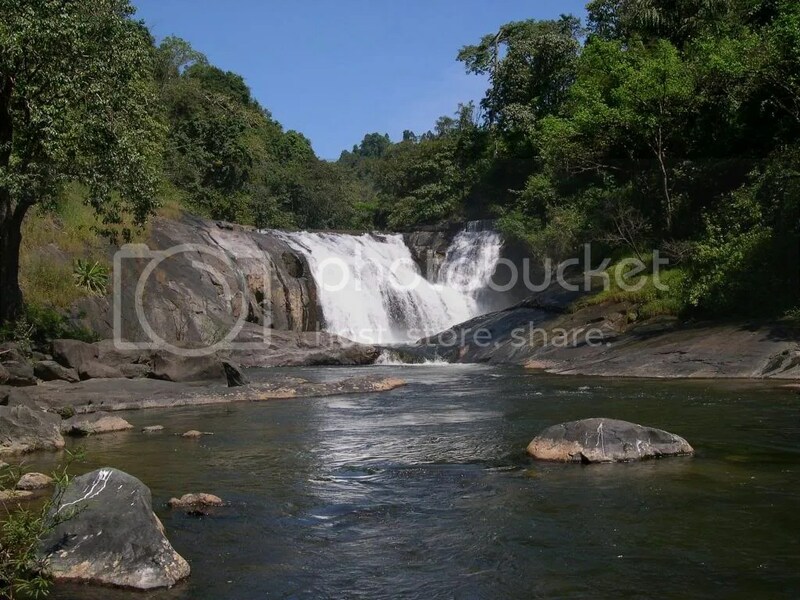 Naagamale is a small village surrounded by forests from all sides. Forest department had arranged our stay in a big room adjacent to a school. We finished our packed lunch comprising of Idly and Chapatti. Thanks to Ashwath (who was responsible for the kitchen department), we had generous amounts of curds which helped us gulp down the cold and dry Idlies. We had lots of time at our disposal and spent 90min of it in the afternoon siesta. At around 3.45PM, we started towards the Shiva temple in Naagamale. It is about half an hour’s climb from the village to the temple which is situated approximately at 1000m. During this walk, Iranna explained about the development activities taken by the forest department which is otherwise known for corruption and lethargy. I was really impressed to know that all the money generated by such treks are really being spent for the development of the villages. In fact the government doesn’t take any money from this trek and the entire money goes to the local area development fund. Many young villagers have come forward and registered as guides for these treks with the forest department. So these treks are kind of providing part time employment for these village youths. The temple at Naagamale has got an amazing setting. 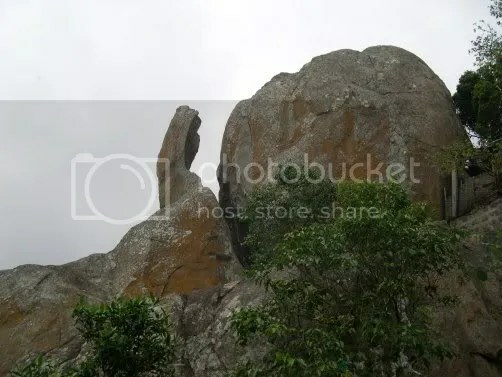 It has a huge rock in the form of a Linga and an other naturally formed rock behind which resembles a Naga (snake). So effectively it looks like a snake protecting a Shiva Linga. 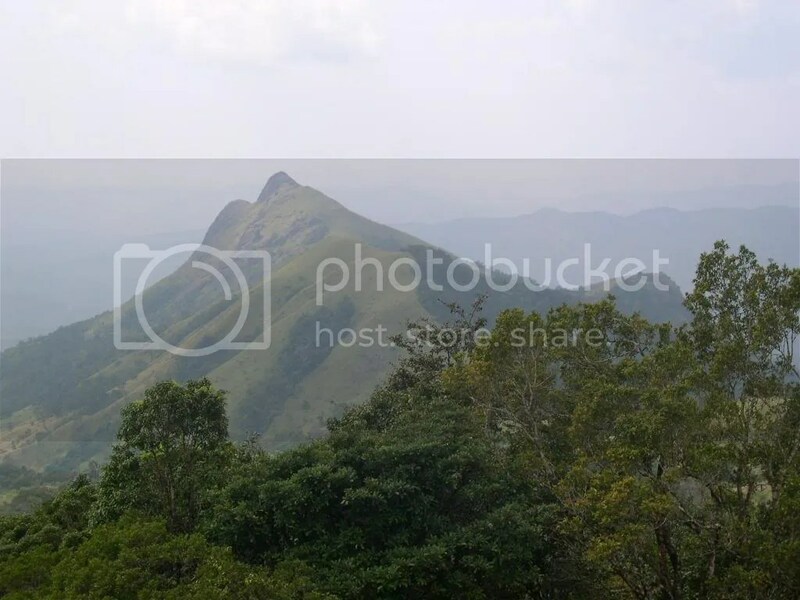 Since this place is at an elevation, it offers panoramic views of the Kaveri valley. 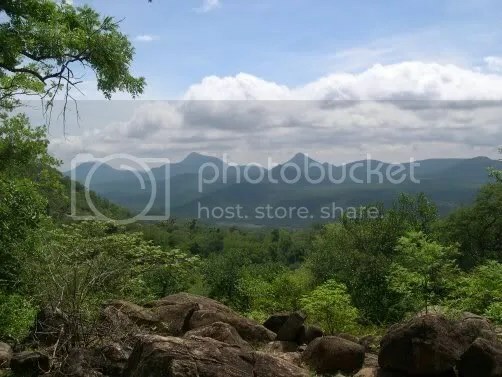 The Hogenakal falls and the backwaters from Mettur dam are visible from here. We spent close to an hour in this place. It has been a practice to cover the distance from the village to this temple with bare feet. In fact I saw a notice board which cautions the devotees against drinking, smoking, spitting and even speaking bad things! We reached back Naagamale village before sunset. While we were idling out time, sumptuous dinner was getting ready for us in a house adjacent to our room. We had carried all the ration from Bangalore itself. In addition to that, the villagers were kind enough to prepare Ragi balls, the local delight. I was eating the Ragi balls for the first time. Though it is extremely good for health, it is not really tasty since it has to be swallowed and not chewed. The room we were staying was so big that it could accommodate at least 100 people. Asalways, the next day started early for me and Naren. It was just 2 days past the full moon and the surroundings were looking pretty nice in the moonlight. We spent some quiet few minutes doing Pranayama before even others were up. 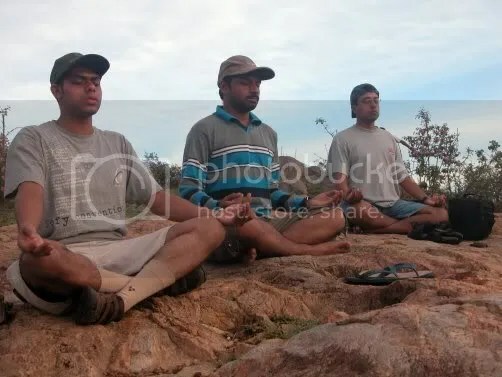 After sunrise Gautham and Ananth joined me in Pranayama while Naren played soothing tunes with his flute. Upma and Gajar Halwa were served for the breakfast. We started on the 2nd days trek at around 8AM. 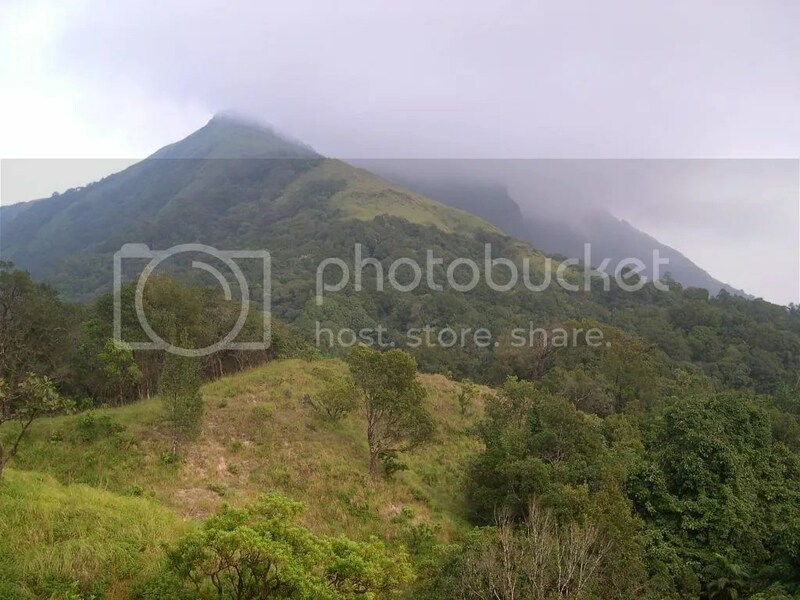 The initial trail from Naagamale till Parasalnatham(654m) is very scenic. 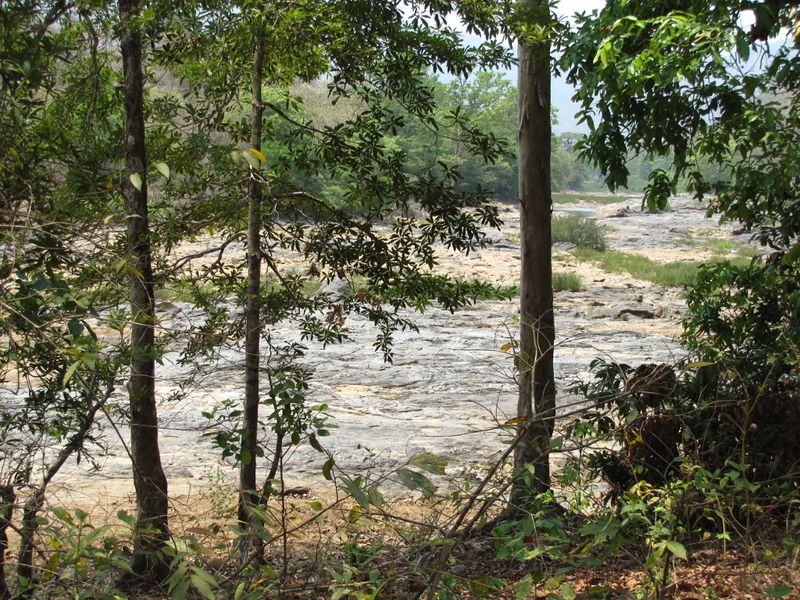 The remaining distance is mostly through the plain forests with not much altitude variations. The 2nd day’s trek also turned out to be interesting. 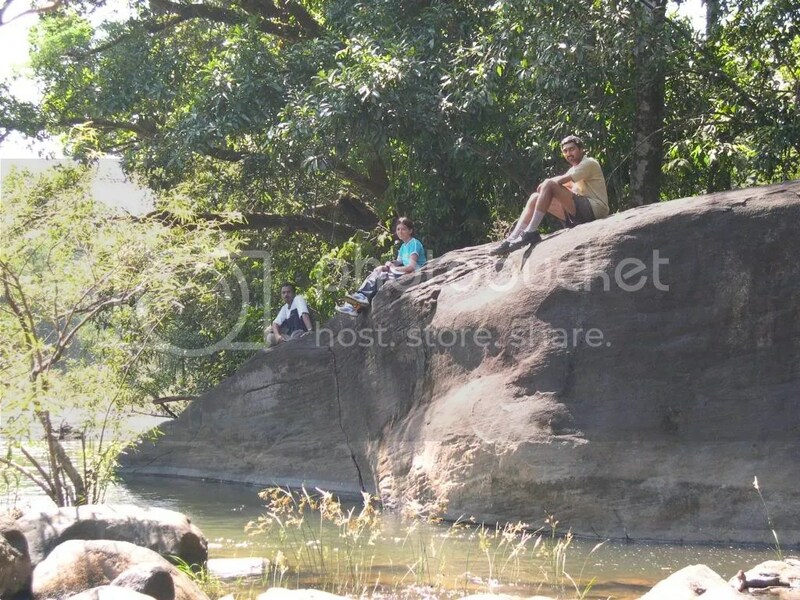 We saw several pug marks, remains of a deer and a chameleon..
Iranna showed us a rock where Veerappan and his gang were once hiding. This is the place from where a village boy doing sentry duties was captured by Police. After a tiring final few kilometers of walk, we finally emerged out of forests and entered the Palar-Gopinatham road at around 12.30PM. Our guide Iranna was carrying a wireless equipment which helped us to get our TT to this point. 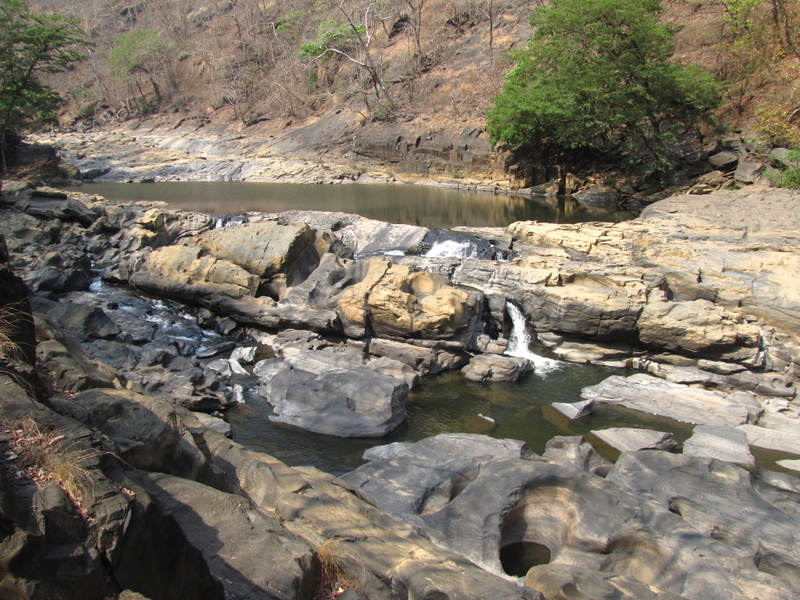 Since we had completed the trek well ahead of schedule, we had enough time to visit the Hogenakal falls. 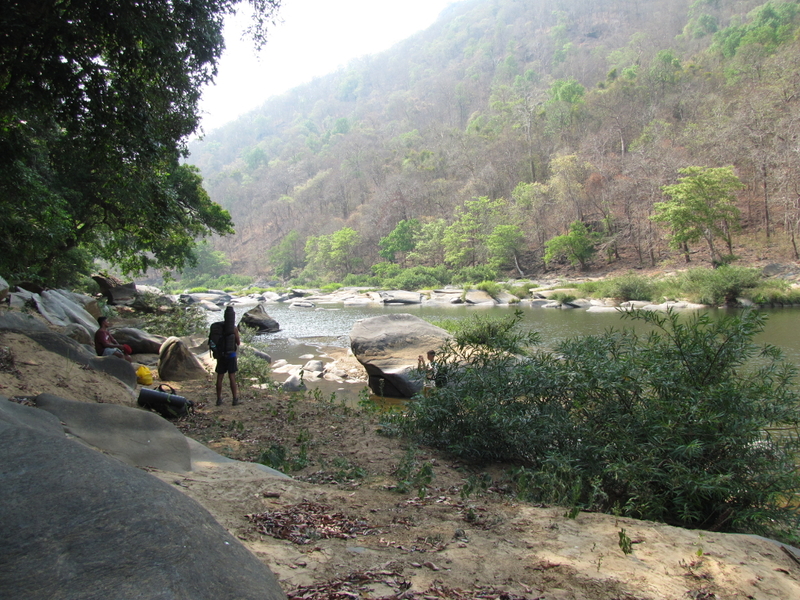 The lunch was taken in the Gopinatham village to which Veerappan belonged. 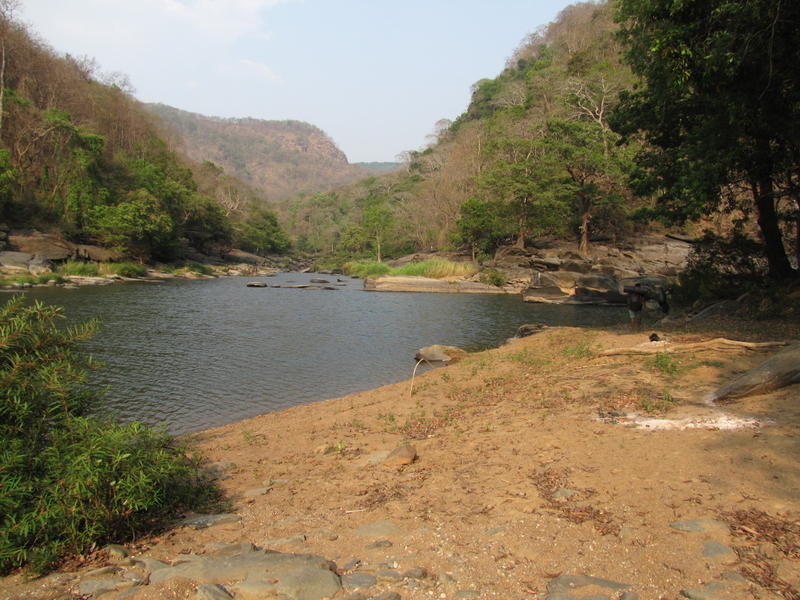 It is around 30km from here to Hogenakal falls. To reach the waterfalls from the Karnataka side, we had to take a coracle ride upstream the Kaveri river for almost a kilometer. 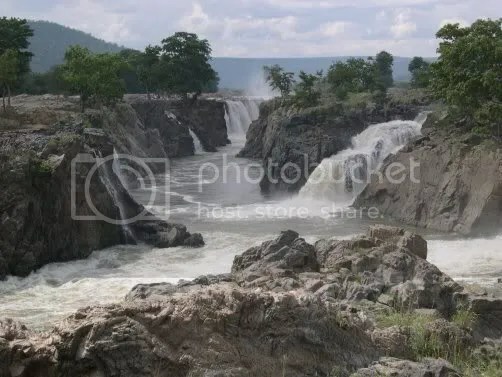 Kaveri was flowing full adding the beauty of the Hogenakal falls. We came back to MM hills where we said goodbye to Iranna and the villagers. These people had been extremely helpful to us for the past two days. In fact, this whole program was arranged and conducted very well by the forest department. After negotiating the bad roads of Kollegal and Malavalli, it was midnight by the time we reached Bangalore.